In 1999, my wine collection was about 500 bottles — the largest it has ever been. Somehow I had convinced myself that this is what wine enthusiasts should do, and I would be even better off if I started architecting a 2,000-bottle cellar plan. So I got my hands on a blueprint for wine storage happiness, and started touring some of my friends’ cellars to get some pointers…and oh boy did I get some! This modest cellar belongs to a friend. What I like most about this one is the temperature is a stable 68 degrees and she paid nothing for the storage materials. Sometimes it’s not about how much wine you hold in your cellar but how well you balance what you have. 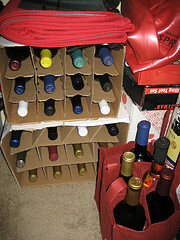 Gary Westby of K&L Wines published a blog post called“Building the Perfect Cellar” and said that the ideal wine cellar consists of: two weeks worth of “ready to drink” wine for the typical home cuisine; 50% of the total stock should be “drink or hold” wines which means they’ll continue to improve with age, but are ready to drink tonight if perfect for the occasion; long-term wines of 10 years or more should take up no more that 25% of your collection; and wine cellars are most valuable when you have the opportunity to load up on an undervalued wine you love. Stephen Tanzer also noted in the article “How to Start a Wine Cellar” that the best wine cellars are meticulously thought out and have a game plan. He suggests a general ratio of 3 reds to every 1 white and that someone interested in building a cellar should taste, taste and taste some more before starting. Wine changes with age and you need to know which, if any, wines you prefer aged. He has a great 100 bottle cellar breakdown if you need help getting started. Today my ‘cellar’ is about 250 bottles—about 50 varietals/styles, with 60 bottles in a Haier wine refrigerator set to age somewhere between 5 and 15 years. Unless I get hit by the money truck, I think 10-ish cases is a solid inventory of great wines that will suit all of my cooking and entertaining needs. And let’s just say that I need a bottle of picpoul that I don’t have in stock for the shellfish dinner that my wife requested the other day…well, K&L Wines has a perfect one in their “cellar” right now for about $8.99. And it’s twenty minutes round trip to get it.